Canon has explained the reasoning behind the decision to make the G1 X premium compact camera sensor almost APS-C sized, but not quite. David Parry, from Canon UK, says it all comes down to the lens, which offers a 4x optical zoom. "We wanted to give people the flexibility of a good zoom, the 4x optical zoom lens is technically a very hard thing to produce as well as keep the camera small," he told us. "If you think of a standard 18-55mm kit lens on the front of an SLR, that's very large in comparison to one of these. We managed to create a four times zoom in a very compact body, and really it has the biggest sensor that we could use and also get decent coverage from the lens. "If you made the sensor any bigger, the lens would have to be a lot bigger and it would be much more difficult and expensive to produce." Although Canon says that the G1 X doesn't really have any direct competitors, one of its biggest rivals could surely be considered to be the Fujifilm X100. Announced back in 2010, Fuji has seen the camera do extremely well, with many attracted to its retro aesthetics. It features an APS-C sized sensor, but crucially it also has a fixed focal length lens. David Parry says that smaller size of the G1 X sensor shouldn't have any impact on picture quality. "You don't actually notice much difference in depth of field, and things like this, because it is so close to APS-C. It comes from the same stable as the EOS sensors, which means that as far as image quality is concerned it's going to be very close to the Canon EOS 600D," he said. 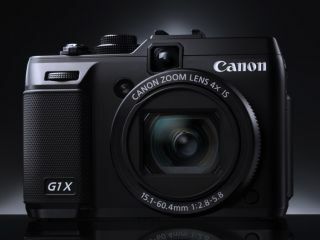 The G1 X sensor is 6.3x larger than that found in the G12, which is still being kept in the market.